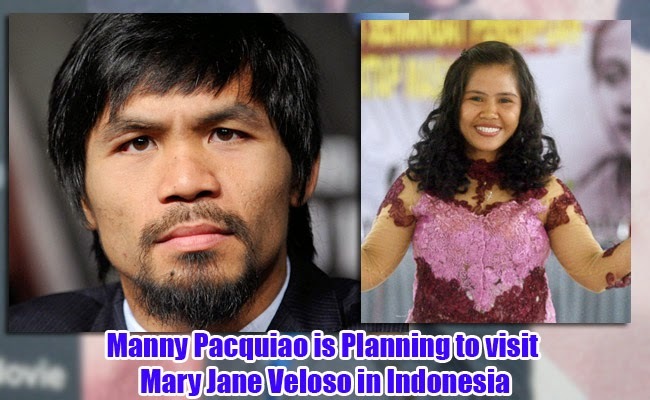 Manny Pacquiao, the Filipino Boxing icon, shared his plan to visit Mary Jane Veloso in Indonesia. Veloso had been recently spared from the execution that was set on April 28, 2015. The execution had been temporarily delayed after the Indonesian government had been informed that Veloso’s alleged recruiter, Maria Kristina Sergio, had voluntarily surrendered. Pacquiao shared to the reporters that he wants to visit Veloso at the earliest that he can which might be on May 4, Monday, just two days after his bout against Floyd ‘Money’ Mayweather Jr. He also plans to speak with Veloso and the Indonesian authorities. Pacquiao wanted to make his visit an official visit and he will talk with the Philippine President Benigno Aquino III. He meant the visit to be state-sanctioned so he can make an official appeal to the Indonesian government authorities. The Filipino boxing champion offered prayers to Veloso and her family. It was past 12am on Wednesday, when the news broke that there were only eight convicts who were executed. Veloso was the only one who’se execution was postponed. The postponement was due to Sergio’s decision to surrender in Nueva Ecija. This development was also accompanied by President Aquino’s appeal to spare Veloso’s life as she can be a valuable witness against a drug syndicate and human trafficking cases. While it is not clear on what will happen next to Veloso, Filipinos shared their thankful prayers in various vigils and social media. Pacquiao earlier made a video appealing to the Indonesian President Joko Widodo to grant executive clemency to Veloso. Veloso was arrested in April 2010 after the airport authorities had detected 2.6 kilograms of heroin stashed in her bag. Veloso said in a testimony that the bag was given by Sergio’s alleged accomplices.